The number of trade agreements in force has drastically increased over the past decades. Since the conclusion of the Uruguay Round in 1994, well over 250 agreements have been signed. While early trade deals were primarily agreed among nearby countries or regional blocs, most extra-regional trade agreements have only come into play since the mid-2000s. And governments are keen to negotiate new trade deals. Examples of this can easily be seen through the conclusion of the recent EU-Canada trade deal and preliminary discussions regarding a possible UK-US trade agreement, contingent on Brexit outcomes. First, do trade agreements boost trade as much between distant countries as they do neighbours? This matters especially when choosing trade agreement partners. In the context of the UK’s withdrawal from the EU for example, would an FTA between the UK and US after Brexit scale up trade flows by the same factor as an equivalent FTA between the UK and EU? Second, are there differences between how free trade agreements affect trade in final goods versus trade in intermediate goods? This is key in today’s globalised world where countries increasingly feed into each other’s production processes and intermediate goods account for roughly two-thirds of total international trade (Johnson and Noguera 2012). Current evidence on trade agreements: Where do the gaps lie? By now, a large body of empirical work finds that trade agreements boost exports overall and facilitate integration into partner countries’ supply chains. Studies by Orefice and Rocha (2014), Mulabdic et al. (2017), and Laget et al. (2018) – among others – demonstrate the trade-creating effects of trade agreements both on final and intermediate goods, be the agreements bilateral, regional, multilateral, or relatively deep in scope. Nonetheless, relatively little research has tackled the interaction between trade agreements and other types of trade costs – such as distance – even though distance is well known to lower levels of trade flows (Head and Mayer 2014 present a survey of the literature to this effect). Instead, most empirical work takes as given that trade costs should impact the marginal cost of trade linearly or in isolation and thus assumes that a free trade agreement will always boost trade by the same scalar amount regardless of the distance between the two countries. This need not be the case. If the distance between two countries were to double, it is unlikely that it would be twice as expensive to ship goods between them as many of the fixed costs associated with exporting over any distance occur early on anyways. For example, some of the highest freight shipping costs are fixed costs such as port storage, loading/unloading, queuing, and so on, which are unrelated to the distance goods are transported. Our dataset includes 185 countries over the period 1965-2010 and all trade agreements in force, disaggregated both by type (using the Baier and Bergstrand dataset) and content of provisions (using the DESTA dataset). Granular, product-level bilateral trade data based on underlying figures from UN-Comtrade allows us to distinguish intermediates from other goods types systematically. As such, we shed light on how countries can apply trade agreements to help achieve regional and extra-regional integration goals, tapping into both local and global production networks. Our results support the idea that production networks among nearby countries explain in large part the multiplicative nature of trade agreements and proximity – primarily through the channel of intermediate goods. Simply put: intermediate goods are both more sensitive to distance and trade agreements than other goods categories. To unpack this, we calculate the impact of a trade agreement at various levels of distance. Figure 1 shows this effect for all goods categories combined (i.e. final, capital, and intermediates). As can be seen, the effect of a trade agreement on the closest country pairs – those which are 80 km apart or closer (log distance of roughly 4)2 – is to boost trade by 90% or more. In contrast, when country pairs are roughly 5,700 km apart (the average bilateral distance in our sample) the boost of a trade agreement to gross exports drops to about 20%. Source: Freeman and Pienknagura (2018). Analysis based on data from UN Comtrade, CEPII, and DESTA. Figure 2 shows that this effect is driven primarily through the channel of intermediates. Isolating intermediate goods from other goods categories, the effect of a trade agreement for bordering/nearby countries is roughly two-thirds larger than the previous case. Moreover, the returns to trade agreements decline faster for intermediates than for other goods types. Importantly, Figure 2 also shows that when country pairs are at the average bilateral distance in our sample, the effect of a trade agreement on intermediate goods is the same as that for total goods. 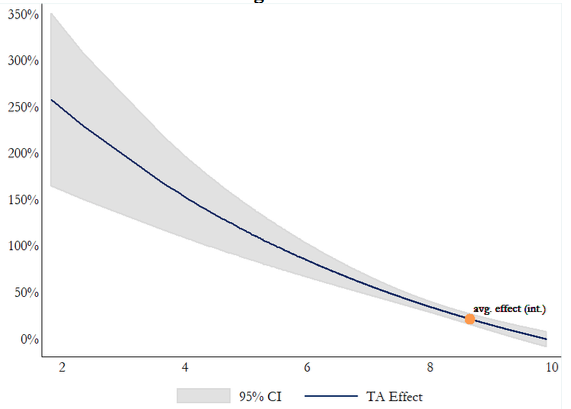 Regression results reported in our paper find that the interaction effect for final goods is much smaller and, in many specifications, insignificant. This supports the notion that proximity reinforces the trade-creating effects of trade agreements especially through the channel of intermediate goods – i.e. the effect of trade agreements on non-intermediates is trivial when countries are at an average distance (or further). Intuitively, this can be explained by the necessity for two-way trade in intermediate inputs to take place in a timely manner for local supply and production networks to function efficiently. Timeliness, though still important, is less so for final goods as consumers are more willing to wait longer for the best goods they can afford. Moreover, trade agreements likely reinforce trade in intermediates more than other types of goods because of their contribution to network effects and connectivity, thus boosting two-way trade in particular. Alongside the surge in trade agreements over recent decades, trade agreements have undoubtedly become ‘deeper’ – encompassing policy areas which extend well beyond the simple remit of tariff preferences (Hoffman et al. 2017). And agreements such as common markets and economic unions represent even deeper commitments than broadening the scope of free trade agreements through their aim to reduce or eliminate non-tariff barriers to the movement of goods. Figure 3 shows that trade agreements tend to be deeper for nearby trading partners, and deeper agreements tend to be signed among countries with similar levels of GDP per capita. Moreover, it has been argued that deeper agreements are more trade-creating (Baier et al. 2014) and distance matters in determining trade agreement depth (Lake and Yildiz 2016). Source: Freeman and Pienknagura (2018). Based on data from CEPII, Baier and Bergstrand and Penn World Table. It is therefore important to also control for both trade agreement depth and differences in GDP per capita among trading partners to verify that our initial result is not simply driven by the fact that trade agreements between neighbours are likely to be deeper (and hence create more trade). Adding these controls strengthens our findings. 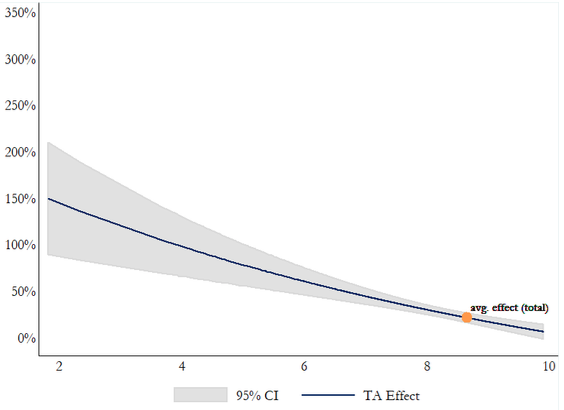 We also test explicitly whether the distance effects for trade agreements vary with the depth of agreements. We find that distance dampens the trade benefits of trade agreements the most for deeper agreements. 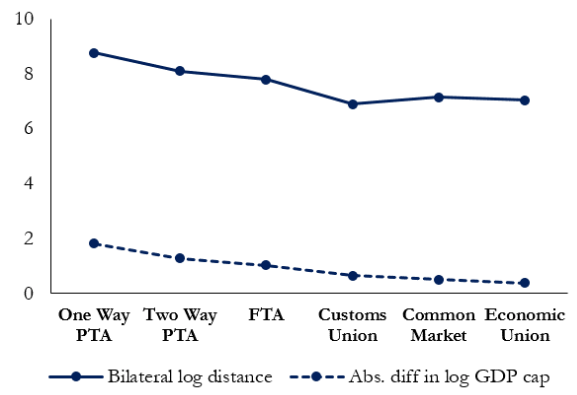 As is the case without distinguishing individual trade agreement depths, this result is driven by the interaction effect between trade agreements and distance on intermediate goods. Empirical research has repeatedly shown that trade agreements are an effective policy tool to spur bilateral trade. With many trade agreements among nearby partners already in place, policymakers have focused their attention on more distant partners in recent years – particularly as a way to foster supply networks through trade in intermediate inputs. This has important policy implications in the context of Brexit and other questions regarding the most effective type and the most beneficial partners with whom to award trade preferences. Specifically, our results suggest that the greatest boost to trade is likely to come from doing deep trade deals with close neighbours, compared to shallower deals with more distant partners. This is driven by the negative impact of distance on trade agreements’ ability to boost intermediate goods exports, which are an important component of supply chain participation. Baier, S L, J H Bergstrand and M W Clance (2018), “Heterogeneous effects of economic integration agreements”, Journal of Development Economics (forthcoming). Baier, S L, J H Bergstrand and M Feng (2014), “Economic integration agreements and the margins of international trade", Journal of International Economics 93(2): 339-350. Cheong, J, D W Kwak and K K Tang (2015), “Heterogeneous effects of preferential trade agreements: How does partner similarity matter?”, World Development 66: 222-236. Freeman, R and S Pienknagura (2018), “Are all trade agreements equal? The role of distance in shaping the effect of economic integration agreements on trade flows”, Review of World Economics (forthcoming). Head, K and T Mayer (2014), “Gravity equations: Workhorse, toolkit, and cookbook”, in E H Gita Gopinath and K Rogoff (eds), Handbook of International Economics, Volume 4, Elsevier, pp. 131-195. Hoffman, C, A Osnago and M Ruta (2017), “Horizontal Depth: A new database on the content of preferential trade agreements”, World Bank Policy Research Working Paper 7981. Johnson, R C and G Noguera (2012), “Proximity and production fragmentation”, The American Economic Review 102(3): 407-411. Laget, E, A Osnago, N Rocha and M Ruta (2018), “Deep Trade Agreements and Global Value Chains”, World Bank Policy Research Working Paper 8491. Lake, J and H M Yildiz (2016), “On the different geographic characteristics of free trade agreements and customs unions”, Journal of International Economics 103, 213-233. Orefice, G and N Rocha (2014), “Deep integration and production networks: an empirical analysis”, The World Economy 37(1): 106-136. Vicard, V (2011), “Determinants of successful regional trade agreements”, Economics Letters 111 (3): 188-190. Baier et al. (2018) also explore this interaction for intensive and extensive trade margins, which complements our analysis nicely. Our work is grounded in the theoretical foundations of a distance*TA interaction term they present for aggregate goods. In most cases these are bordering countries. If the countries do not border one another, they are only separated by a small body of water.